The opprobrium that stemmed from Rohith Vemula's suicide was the primary reason why Irani became the target when Kanhaiya Kumar was arrested. She mentioned in her speech that the expulsion of Rohith was done by the HCU committee, all members of which were appointed during the UPA regime. Ms. Irani also mentions that in his suicide note he said no one is responsible for him committing suicide but that doesn't close this chapter. Every hour two Dalits are assaulted; every day three Dalit women are raped, two Dalits are murdered, and two Dalit homes are torched.No one believes these numbers are anywhere close to the reality of crimes committed against Dalits. Therefore instead of ranting about what happened after his death, please focus on the circumstances that caused him to take his own life in the first place and take the actions required. Do not tell the nation how you pleaded for the appointment of a Dalit chancellor. Take actions against those responsible for their biased treatment of Rohith. Sorry to go all Arnab here but Ms Irani the nation doesn't want to know about the details of political blame games. Also, Ms Irani needs to sort her priorities. She said, "Oommen Chandy, Shashi Tharoor also sent letters to me, and we responded immediately. Today, I am being accused of discrimination? Even I can do the same." Sorry to go all Arnab here but Ms Irani the nation doesn't want to know about the details of political blame games. We are well aware that that's the most played game next to cricket and plus you were doing your job. Ideally, she should have used the platform to fill people in on the details of the proceedings of the case. "I look at this child who has been mobilised as a weapon against the State. This is a child who does not have an idea that India is one, but a child who must have been infected with this thought. By those who want to bear arms to overthrow the state. It bears the name of Kanhaiya Kumar, Shaila Rasheed, Rama Naga-they are all members of the student union." Yet, serious sedition charges have been pressed against these "children". If they were arrested or detained for interrogation purposes, it is one thing, but the serious charges against them are unacceptable. That's what has led to this chaos. Another discrepancy was when she said: "Don't turn education into a political battleground." My alma mater St Xavier's College was entangled in a huge controversy when a letter addressed to the students from the principal, Father Frazer Mascarenhas, criticized the Gujarat model of development. Don't preach what you don't practice. As someone who supports the BJP government, I repeatedly emphasize that being a ruling political party, it should accommodate everyone's views and opinions. Do not try to control views and opinions because that will result in a social anarchy. 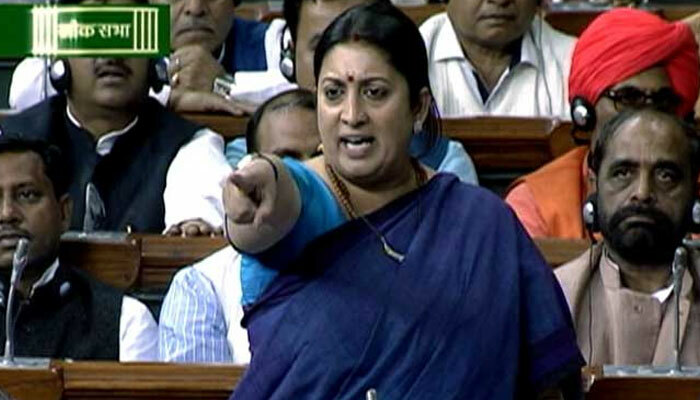 The most remarkable Smriti Irani made in her speech was the fact that when 'anti-national' remarks were being made in the Jawaharlal Nehru University campus, a student of the same university named Pawan Kumar sacrificed his life so that we remained in the state to debate about freedom. With that statement, she did school everyone in my opinion. Her mentioning the celebrations by JNU students of Mahishasur Martyrdom Day was also eye-opener for the ideologies the youth are today are entertaining. Her mentioning the the celebrations by JNU students of Mahishasur Martyrdom Day was also eye-opener for the ideologies the youth are today are entertaining. I am all for students' rights to express their views and opinions but I would also encourage all to practice common sense and to show some respect. In the meantime, For example, why isn't anyone protesting and question the gruesome murder of Sujit, a 27-year-old RSS worker who was hacked to death in front of his aged parents in Kannur district in Kerala? What about when two Dalit girls were found hanging from a tree in Katra village in Badaun district of Uttar Pradesh? Justice is awaited but it will come to little avail unless there is resurgence of lost character not just among our politicians but among ourselves too.